I came across this quote two days ago, and it really resonated with me and made me smile. I’m a woman and I like to chat! What can I say? My opinion is that fun should be part of fitness. Enjoying workout is the key to keeping exercise a part of your life. However, don’t overdo it. 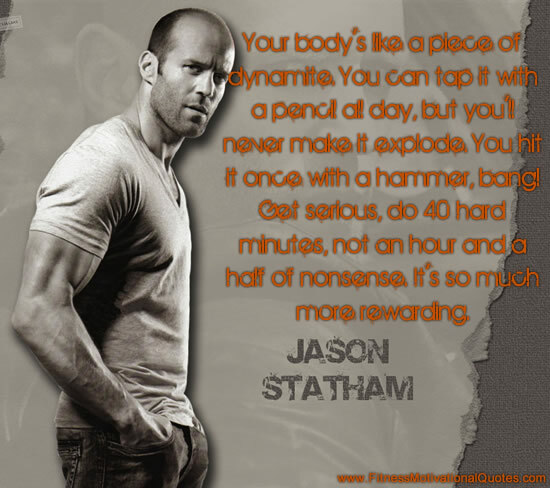 🙂 I agree with Jason Statham. It’s not quantity, it’s quality! It does not matter how long you exercise but how vigorous you workout is. How do you know you did a good workout? From my experience I can say your body will tell you. You might feel a bit weak and sore the next day or two. I always feel good all around.